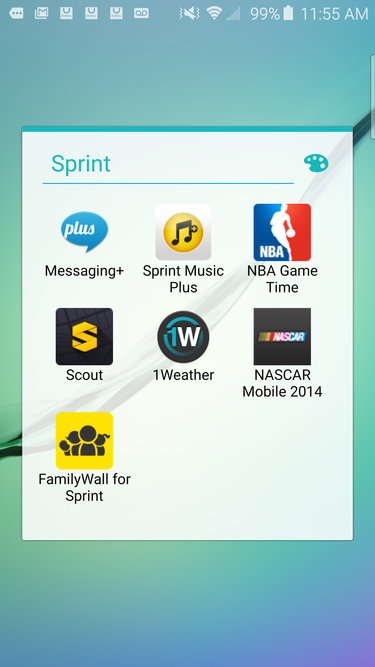 These pre-installed apps from Sprint can be uninstalled on the Galaxy S6 Edge. "Samsung is committed to providing the best possible mobile experience to customers. The pre-installed applications on the Galaxy S6 and S6 Edge devices are intended to provide an enriched mobile experience while enhancing the functionality for our users. Functions and settings for each application have been reviewed in detail and were carefully selected based on customer feedback. Pre-installed applications can be disabled on both devices; however, the number of applications that can be disabled will vary by region and mobile carriers." When asked how Samsung defines "disabled," the response from Samsung's spokeswoman was that pre-installed apps "can't be totally removed; they can be hidden from view. This is why we did not say they could be removed but disabled." "Simplicity is critical for usability and functionality, so Galaxy S6 and Galaxy S6 Edge offer a refined and optimized user experience and the offering of core and preloaded apps has been streamlined. Some apps can be uninstalled while some can be disabled, and this varies by region and carrier. Further, 40% of the features and steps have been deleted compared to previous models."